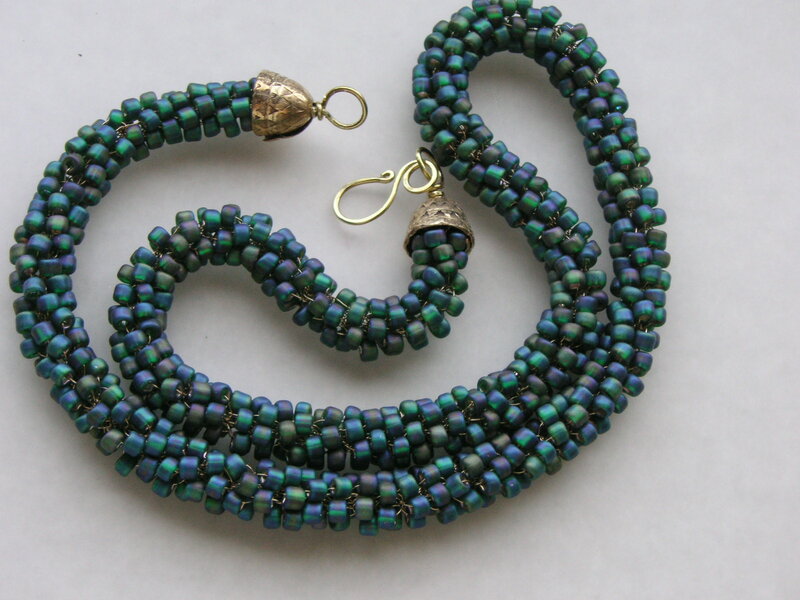 For the past few years, I’ve been playing with bead crochet – I am surprised at how much I really enjoy this technique, considering that most of my jewelry work is with metal. I love teaching classes in it, making/selling my Starter Jig (which is now patent pending!! 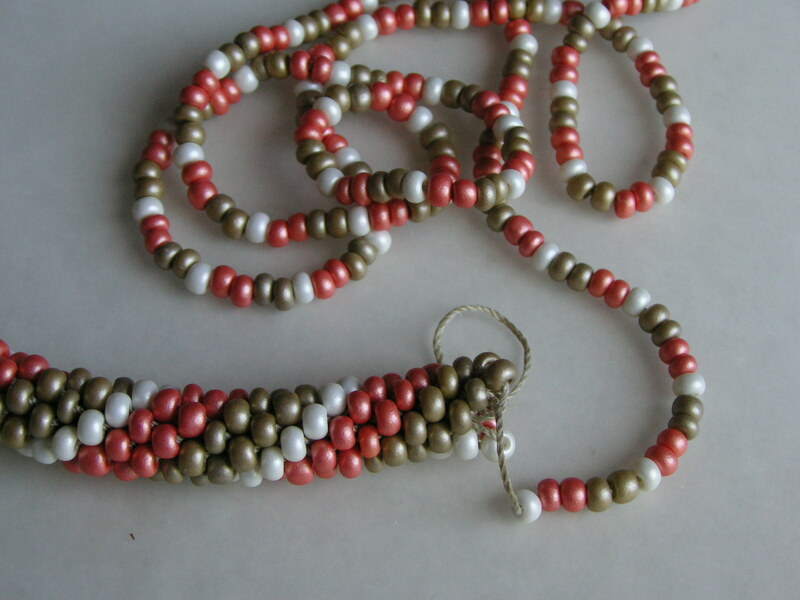 ), and I have found creating bead crochet ropes to be very satisfying. So it was really very cool, and unexpected, for me to find something new that I just didn’t expect in bead crochet ropes – working with wire. 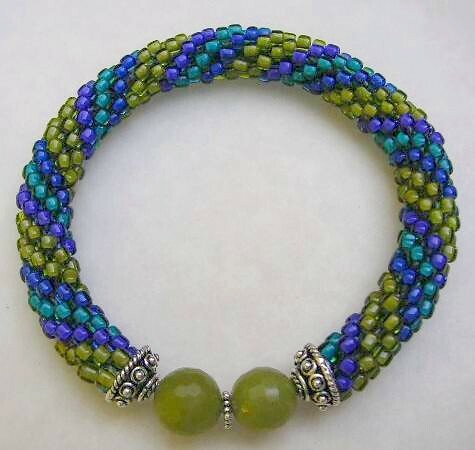 Now I know people create wonderful jewelry by crocheting wire – I think the open and airy weave is wonderful… but making crochet beaded ropes has been really difficult, because it’s almost impossible to get the first few rows started. But I’ve been talking with the great folks at Beadalon (who now own Artistic Wire) about carrying my Starter Jig in their product line, and they wanted to know how it worked with wire. So of course I gave it a try…. and what a surprise! My previous attempts (without the Starter Jig) failed miserably, so I didn’t think it would work, but I was thrilled to find that not only was I able to use the Jig with wire, I also got a different look. Using thread in bead crochet ensures that you have a nice tight stitch in your rope, but when using wire, it’s better to create rows that are much looser. 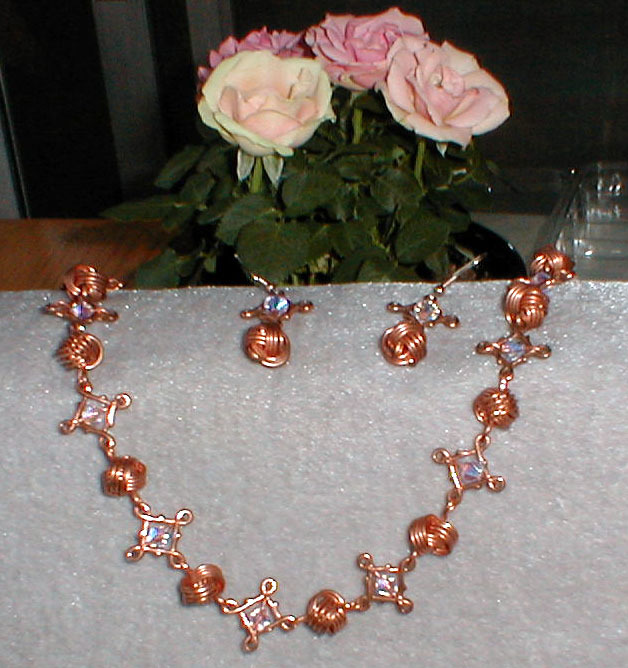 The wire becomes a real design element that shows through the stitches, not just the means to hold the beads in place. Isn’t this just such a cool look… I love it! I am looking forward to playing with different colored wire to create some interesting contrasts. And I love that I can now show my students that using wire is a great additional option when I teach classes. For reference – I made my bracelet with size 6 seed beads and C-Lon Beading Cord, and the necklace with size 8 beads and 32g Artistic Wire. 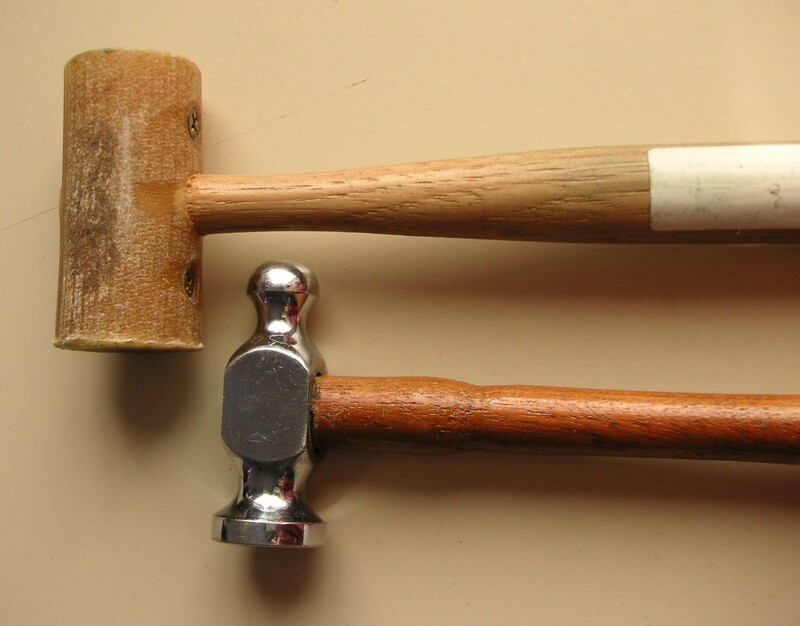 Hammers vs. mallets – which one to use?? Well, the answer is obvious… use them both! So the better question then, is which one to choose, and why. They are shaped similar to each other, and both of them are used in a similar fashion, but they produce very different results. Mallets come in a variety of materials – plastic, nylon, rubber, wood, and my favorite… rawhide. They all have one major characteristic in common – they are made of a softer material than whatever they are striking. Hammers though, are made of steel, or some other material that is harder than what they are striking. Whether you use a mallet, or use a hammer, both of these will work harden your item. Because it is softer than the material being hit, the mallet will absorb the force, and won’t affect the surface or altering the material. Since a hammer is harder than the material you are working with, it will cause the material to expand and flatten, as long as you are on a steel block or anvil. 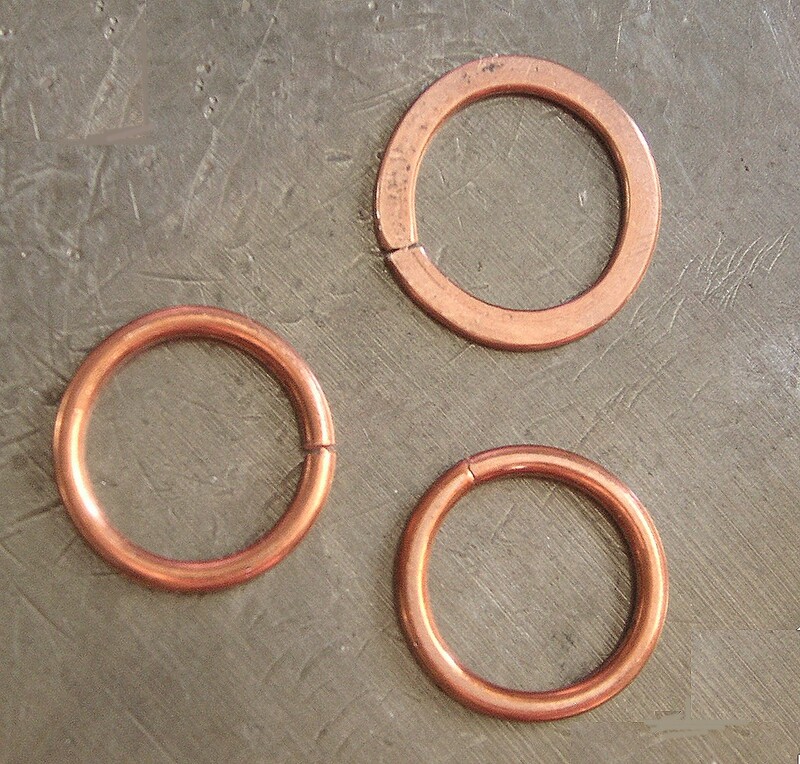 I cut a few rings to show the results of hitting with a mallet, vs. hitting with a hammer – you can see how the mallet moved the metal just a little (see how the ring opened just a tiny bit), but the wire is still round, whereas the hammered ring has flattened out and expanded. I love the look of hammered wire, but there are times when my design looks better without the flattening or texture, so it’s useful to know how to use each tool. Our wonderful coordinator Yvette (who did a fabulous job! 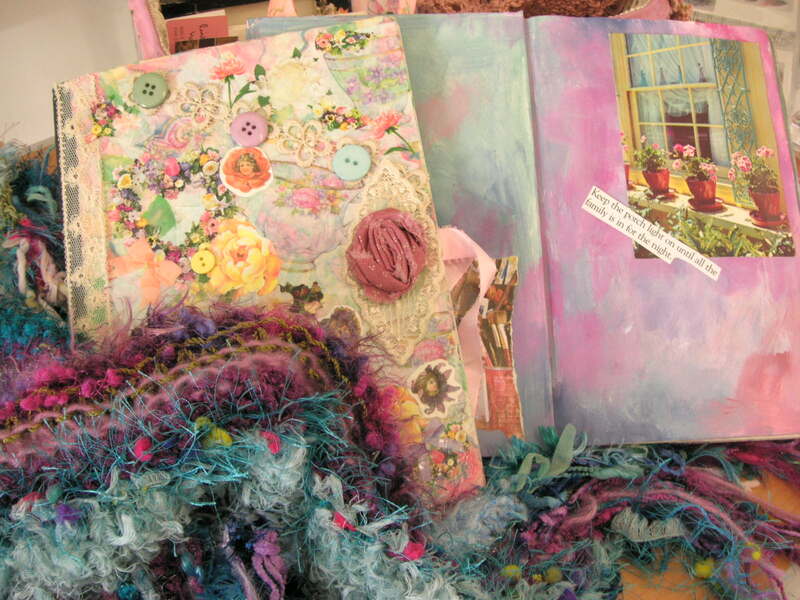 ), of Autumn Lane Studios, creates some really beautiful, textural mixed media work. 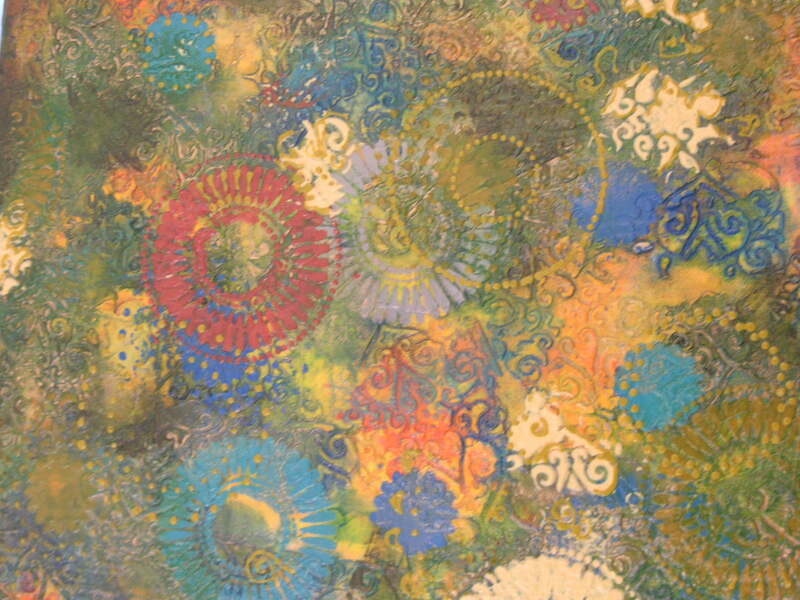 This dimensional painting has a warmth and a richness that looks so much better in person! 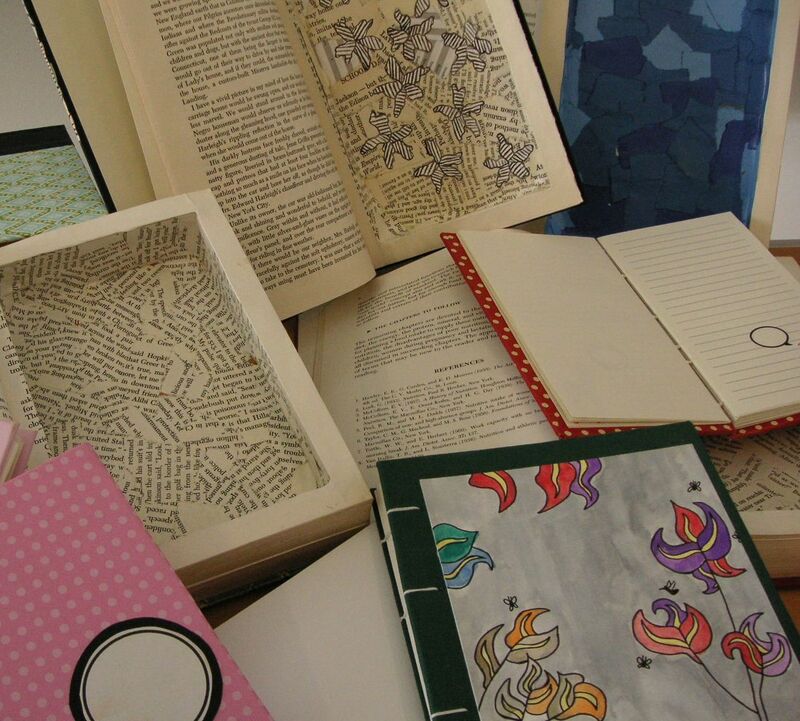 Looking at old books in a new way, to make then both useful and interesting is something that Teal Stripes has made into an artform! I remember the “book safes” you could buy to stash your valuables in, but these are just too fun to hide away! Rebecca of Naturally Eco Memories showed us her cards and gift creations with a definite vintage look – the style, the materials, even the subtle colors, are all reflective of her love for authentic vintage ephemera. 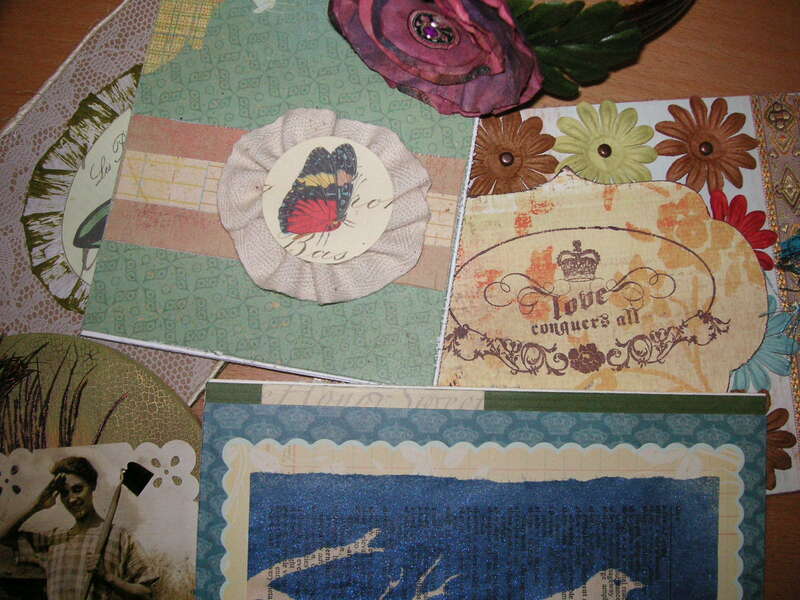 Carole’s Designs makes some beautifully hand colored and painted journals – always inspiring when you want to wax poetic! Her multi-fiber knit shawl was just scrumptious! 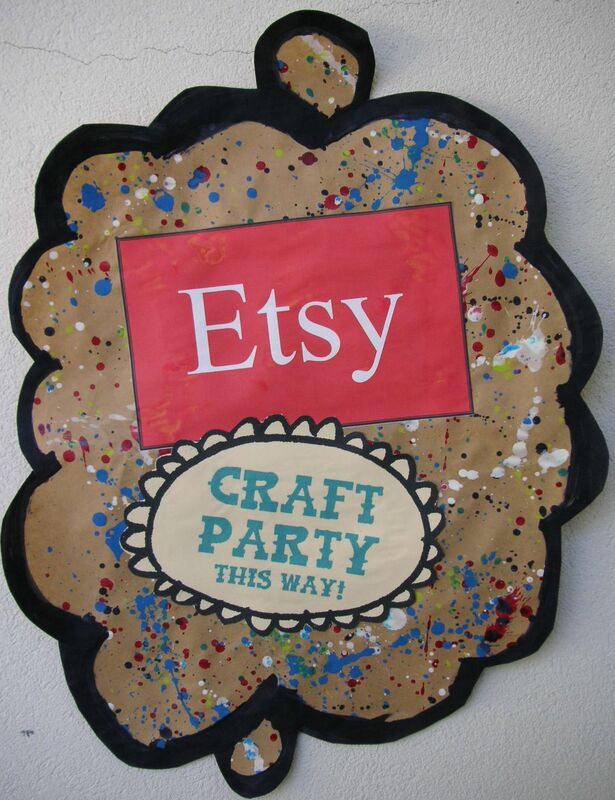 Carole isn’t on Etsy yet, but I look forward to seeing her shop there soon! 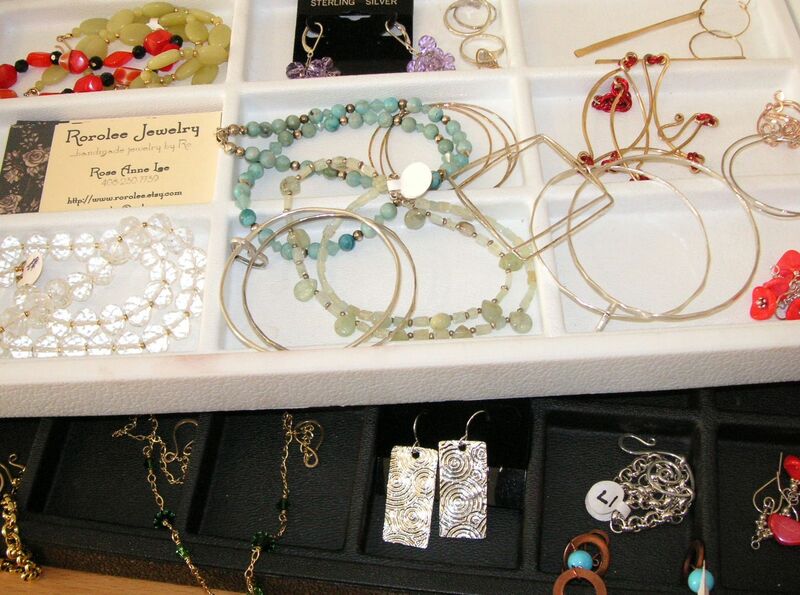 Rose Anne from Rorolee Jewelry brought in some shiny baubles! 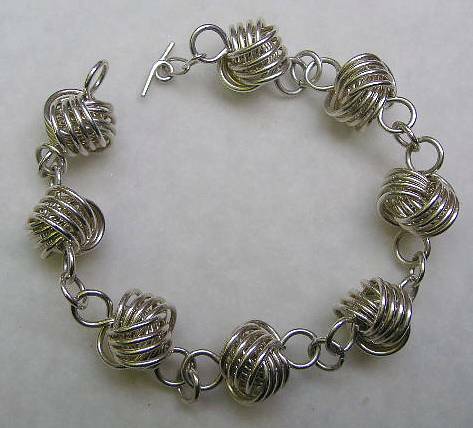 Clean lines, warm gemstones, and chain links make her work contemporary, with just a little bit of trendy kicked in! 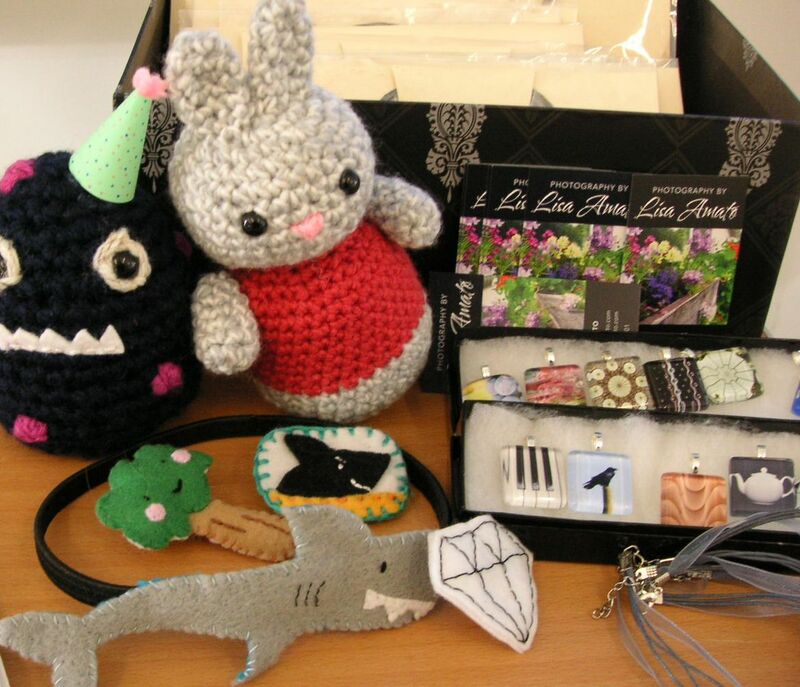 Fun felt and knit animals from Lindsay Harmony gave us a little entertainment – I can hear the theme to “Jaws” when I look at her shark! And one of Etsy’s favorite photographers came by – Lisa from PhotoAmato – bringing some of her photo cards and great tile pendants. It was a fun time, and I look forward to some more creative meet-ups… the Bay Area is truly fortunate to have so many very talented artisans! 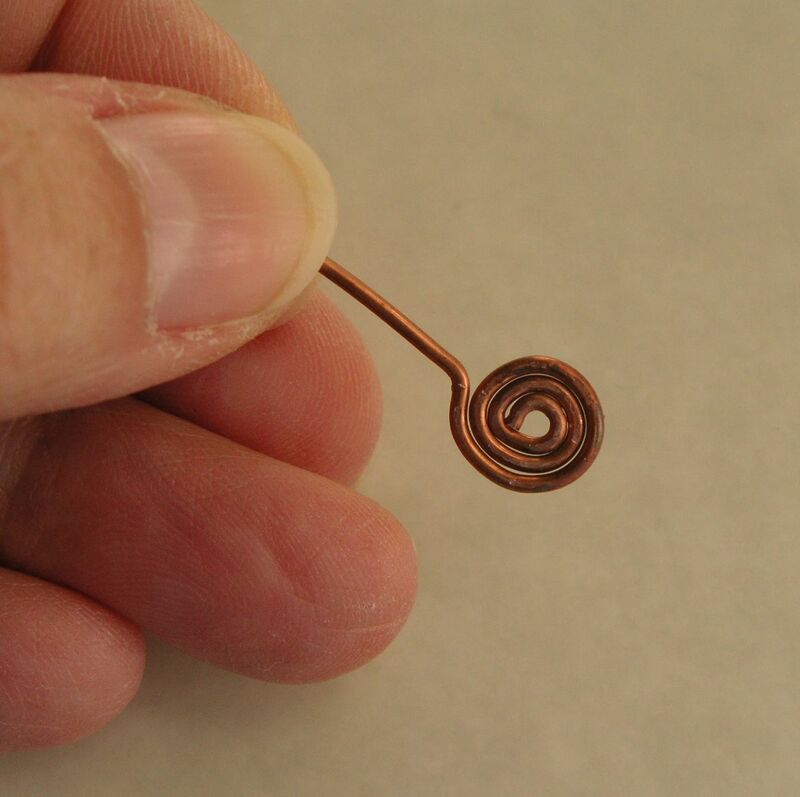 Do it Again, and Again, and Again – Perfect Spirals!! First, I cut a piece of wire 3 inches (this is 18g wire, for reference), and make a very small loop at one end using round nose pliers. 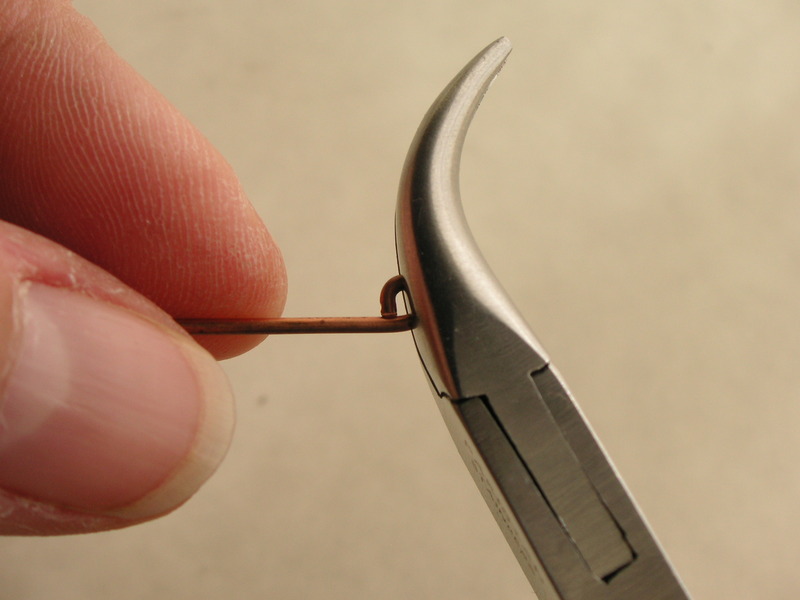 Next, I hold the loop in flat nose pliers (I am using bent-nose pliers, but you can use any flat pliers). 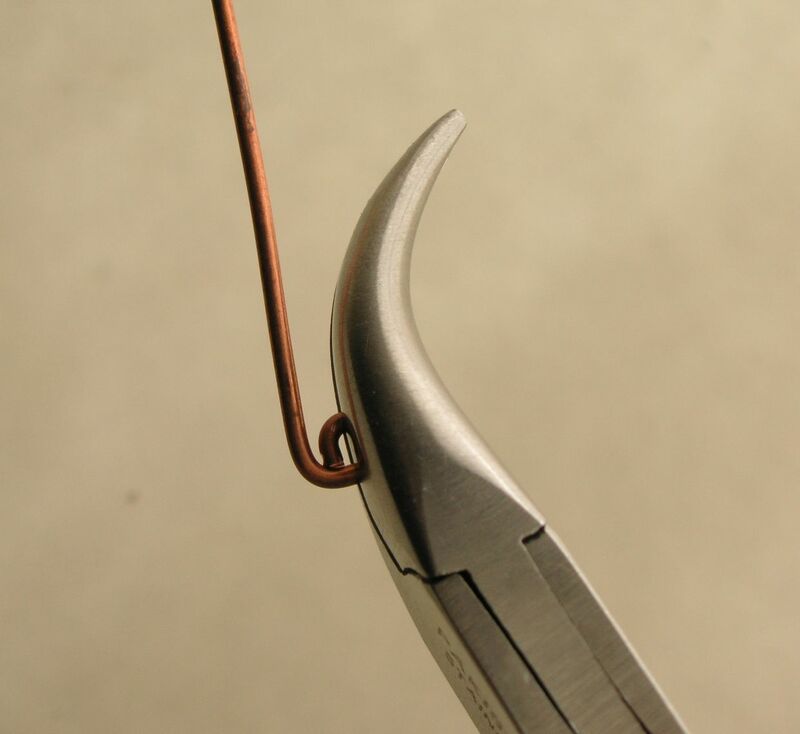 I am holding the wire straight out, near to the base of the pliers, not at the tip, so that I can get a good grip on the loop. Holding the loop tight in the pliers (note how you can see part of the loop sticking out), now I bend the wire straight up, wrapping it along side the loop. 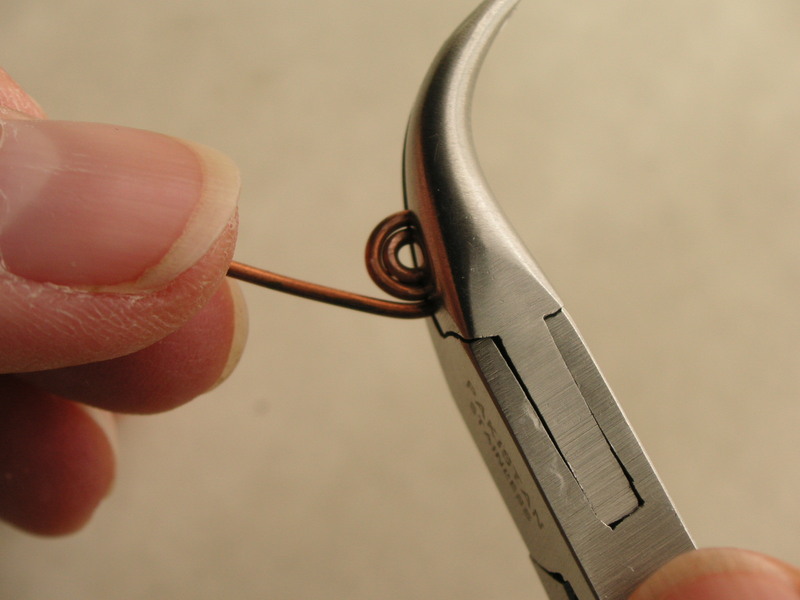 I reposition the loop in the pliers, and repeat, until the spiral is the size I want. I measure the wire left over from the spiral, and subtract it from the 3 inches I started with, to get the length of wire I used for the spiral. All wound up - spiral complete! 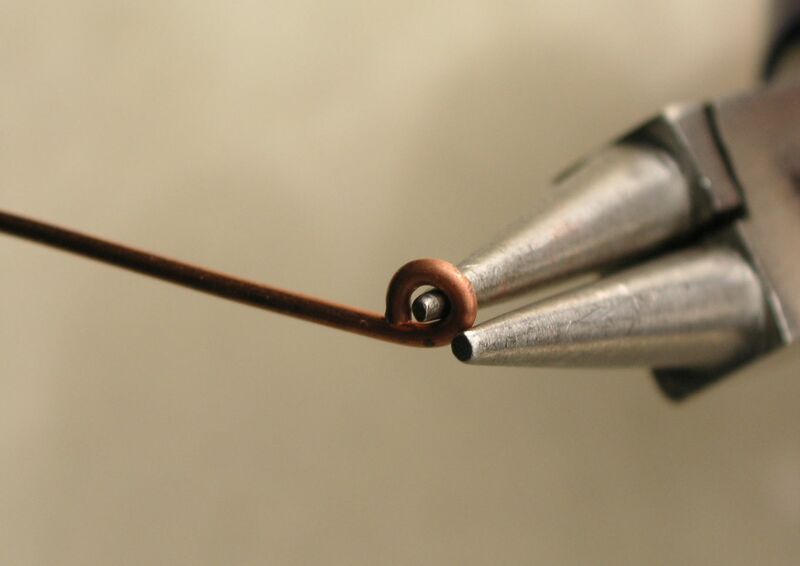 I do this with different gauges of wire, and then mark the sample items with the both the measure and the gauge. This way I can just pull out a spiral, and duplicate it by using the same wires. Making templates is easy, and saves me alot of time, effort and wasted wire. 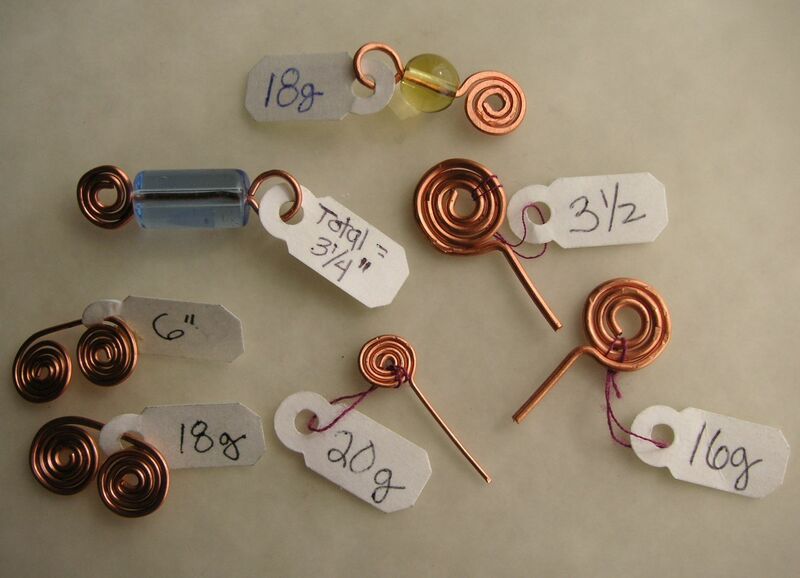 I make up examples in copper wire for links, clasps, earwires, and loops too, and store them in little ziplock bags. 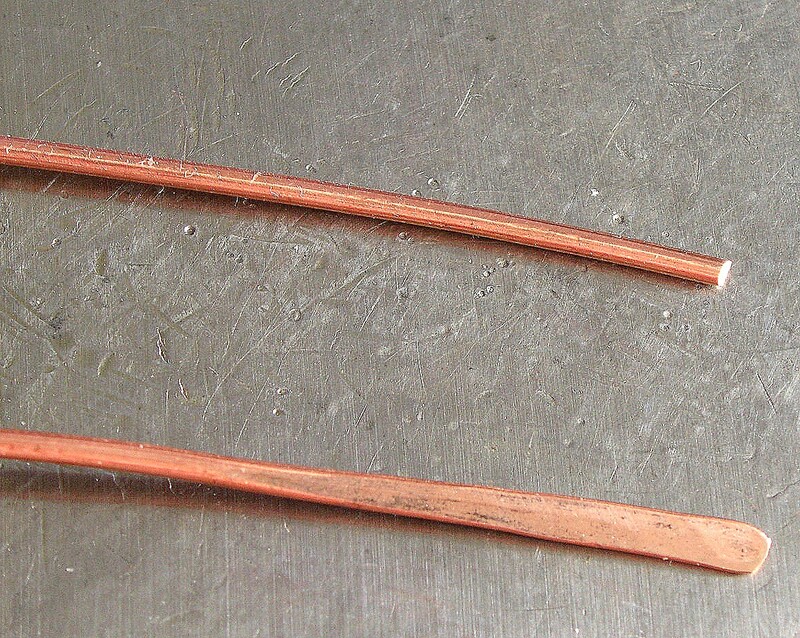 If you make wire jewelry, consider making up some sample wire templates – you’ll always have real examples of all different kinds of wire components easily available. Naming a company, or a business, is very personal, and NOT easy! You try to come up with a name that is memorable, reflective of what you do, and isn’t going to confine you, in case your business changes a bit. The name also has to be available so you can own the websites associated with the name, otherwise your customers will never find you! 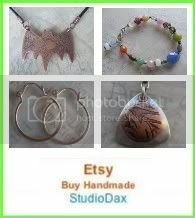 So how did I come up with the name “StudioDax” for my business?? Well… the “Studio” part is easy to explain – it’s where I create, and where I love to be. The “Dax” part is a little more personal. It has taken me many years to admit this, but I am a geek. Not a huge one – I’ve never been to BayCon (if you were a sci-fi geek, you’d know what BayCon is! ), and my geekiness is fairly limited in scope, but I am … a geek. 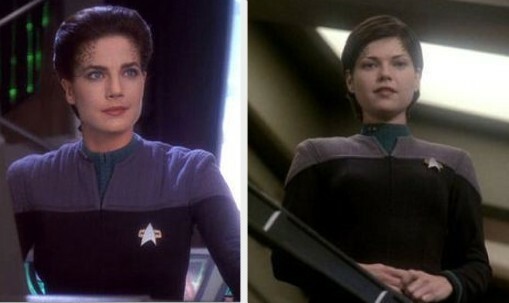 And Dax is one of the characters I always enjoyed and admired most on the Star Trek Deep Space Nice show. Dax was character that was a joined species, with a host humanoid Trill, and a long-lived symbiont. And each time the host dies, it would join with a new Trill, retaining the memories and skill of the previous lives. All in all, a very strong, interesting character! So that’s how I became “StudioDax” – it’s easy to remember and easy to spell, it reflects a bit of my personality without being “too geeky,” it’s broad enough to continue using as my products changes, and the website was available… all the key elements of a good business name! And I really like how it sounds too! I have always admired the folks who work with seed beads making beautiful intricate patterns – they make the beads come to life. 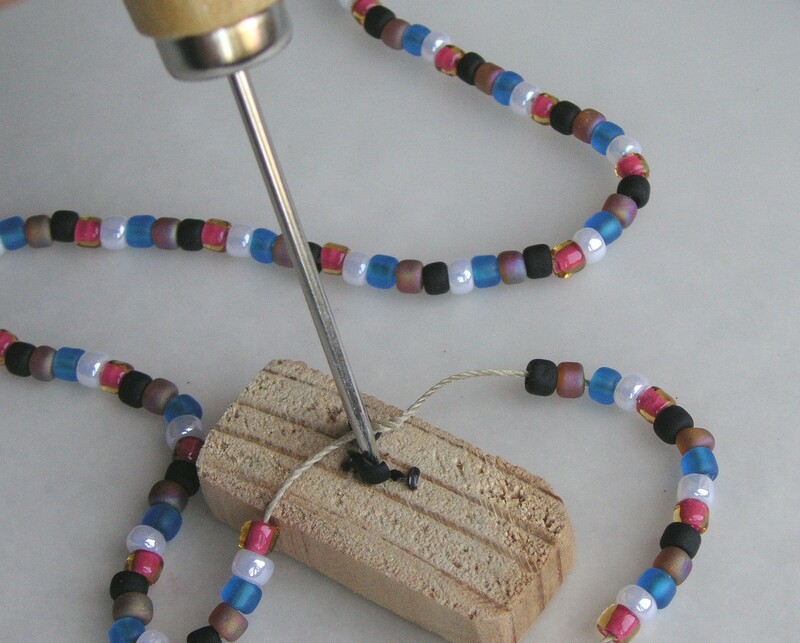 But my brain and fingers just don’t work that way… the beads get the best of me! But after taking a class in Bead Crochet Ropes a few years ago, I have found a way to satisfy my occasional seed bead craving!! 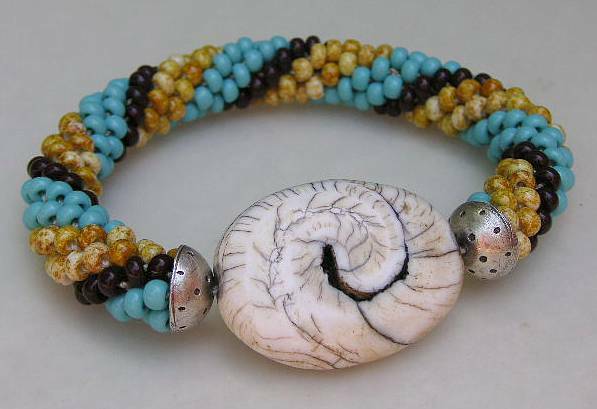 There are re are many options and variations in the bangles – I can create spiral patterns by changing up the bead colors, textured spirals by varying the bead size, and mosaic looking patterns by randomizing the beads. But no matter how I string on the pattern, invariably there will always be a bead or two that is not right, and needs to be broken off the thread. 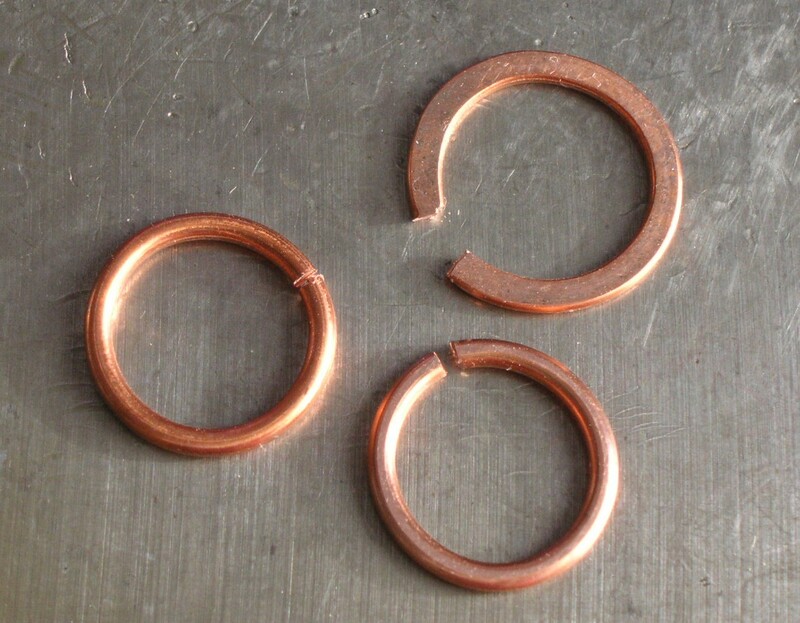 You can do this the wrong way – by whacking the bead with a hammer, or squeezing it in pliers (you might cut the thread), or you can do it the right way, by breaking the bead from the inside. 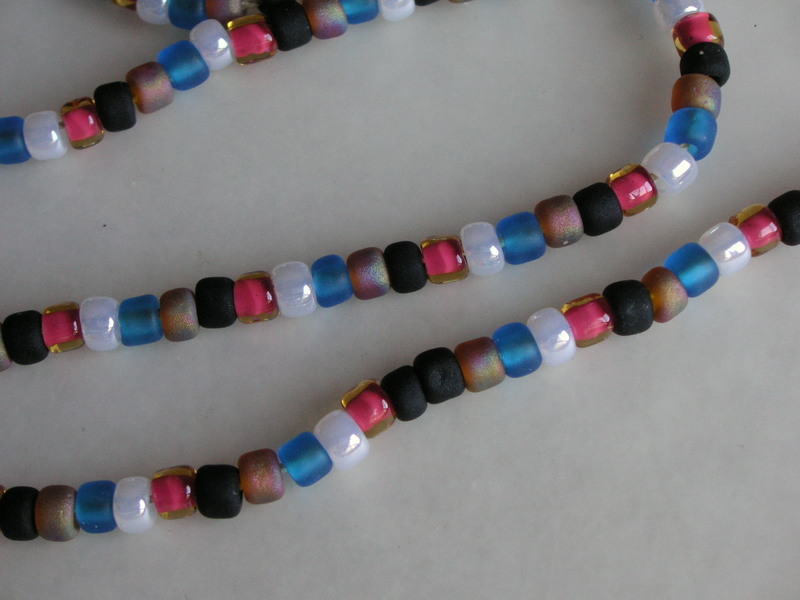 In this example, I am showing that the pattern is incorrectly strung with 2 black beads together. 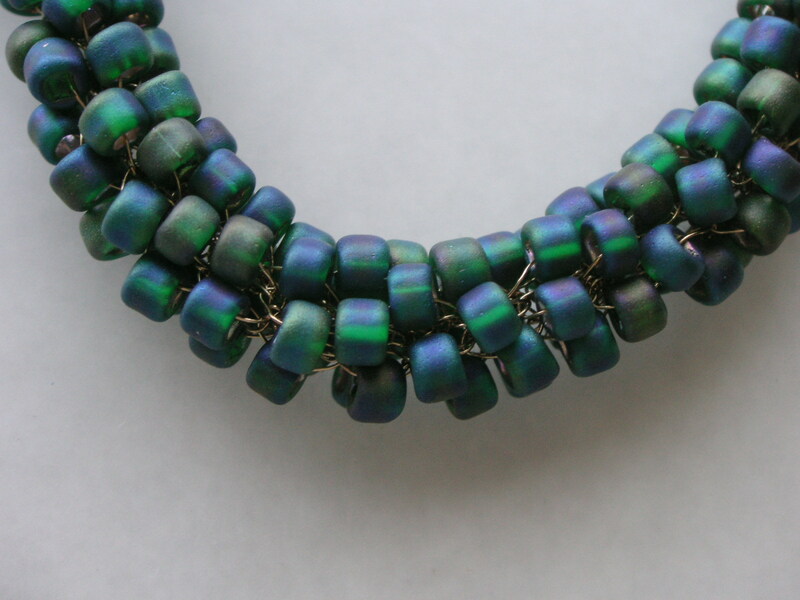 I need to break the bead to keep the 5 color spiral pattern, and I want to do it without cutting the thread. 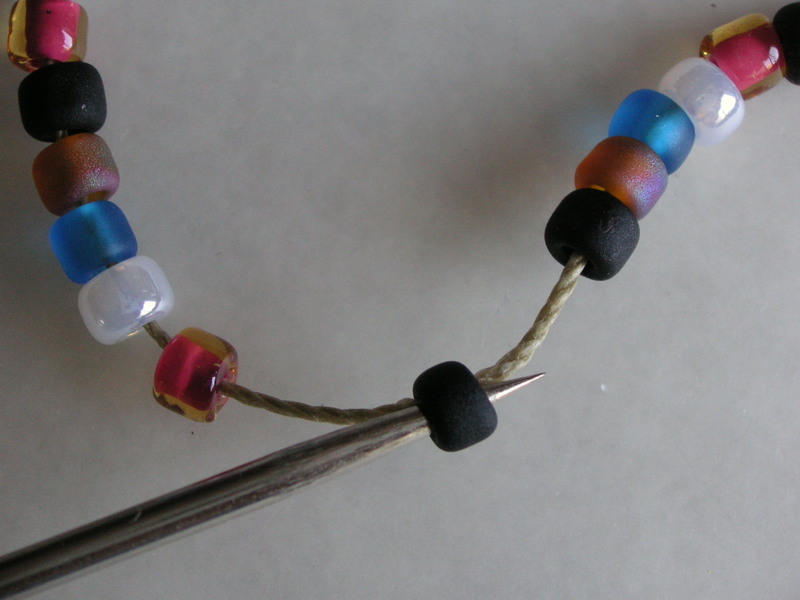 The first thing you need to do is put the tip if an awl into the bead you want to break. Make sure that the awl does not slide all the way into the bead – most beading awls are very fine, and may be too thin to break the bead. 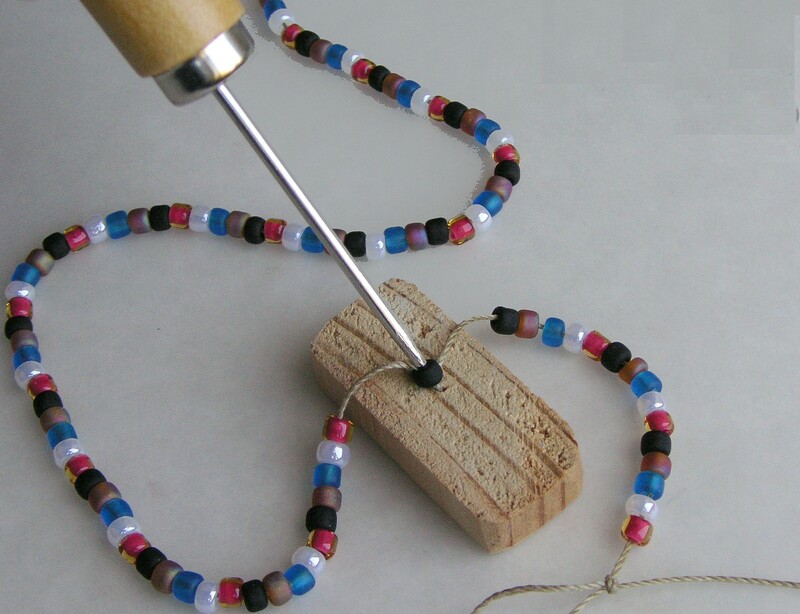 The next thing you need to do is put the bead on a block of wood , with the awl positioned in the hole (make sure the point of the awl does not split the thread). You can use a stack of cardboard instead of wood – you just need a surface that is firm, but will give under the point of the awl. Step 3: push, push... and crack! I love creating these bangles, and have created a tool for making it easy to get started. If you’ve ever wanted to make them, or have tried, and found it frustrating, please check out the tool/tutorial I have in my Etsy shop. I love designing and creating jewelry, and I love teaching, so it’s not surprising that I really love to teach jewelry making classes! Part of the fun is seeing what my students do after they leave the class, when they adapt new techniques into projects that reflect their own personality and style. The components are really well balanced (notice how the knots are about the same diameter as the center of the open links), and the crystals provide a little bit of sparkle… and we can always use a little sparkle! So remember that the techniques you learn in class are not limited to the class project – add your own style, and make it your own. And your class instructor will LOVE to see what you’ve done, so make sure and let them know!! 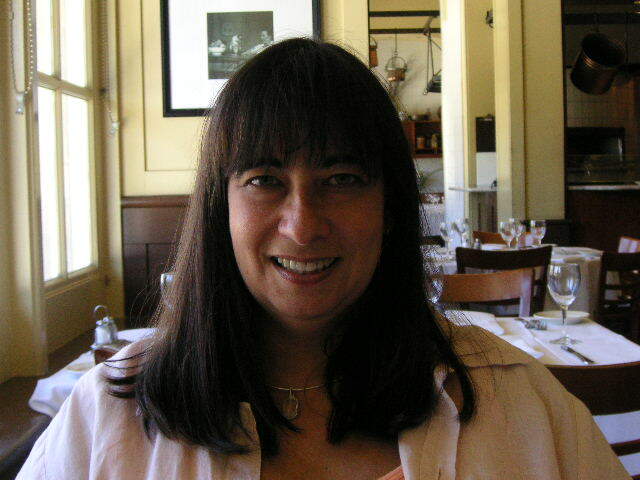 Thanks so much Bev, for sending me your photo! And if you’re in the SF Bay area, I’d love to see you in one of my classes… you can see my schedule on my website (and check it out – I’m teaching Danish Knot in a few weeks! ).